My lifestyle was just like anybody else's that was overweight. My days, weeks, months, years were filled with, eating too much, looking forward to the times I could get together with friends and just pig out, and just sitting in front of the TV or computer with a bag of chips fully knowing that by the time I got up they would be almost gone. Bad food choices coupled with the absolute avoidance of any type of activity over the years led to me being who I was at the end of 2006. I started January 2, 2007 after the holidays since I knew I would fail if I tried to start right during the worst time of year for eating. The first thing I did was slow down with my portions, and think about how much I was eating, added more water, and stopped all sodas. I did this for one week before doing anything else. Starting the second week I changed my schedule drastically. I was used to staying up till midnight or 1:00 am everyday. I started going to bed at 10:00 so I could get up at 5:00 am. I started getting up at 5:00 am every day and going for a walk. I didn't do anything special, I just got up and walked for about 30 minutes everyday. That was pretty much all I did for the first 2-3 months, but I was seeing the weight come off at a good rate. After 2-3 months I thought about running, but figured I couldn't do it. I started running about 100 yards at a time a couple days a week, but was absolutely exhausted. I didn't give everything up, just kept walking and eating less and felt good about myself for what I was doing. I did think about switching it up a bit so I decided to join a gym. I found a no frills gym and joined. I had to change my schedule a bit to figure in the travel time so I started to get up at 4:30 am. I had no idea how to use the equipment, so the first week I just walked on the treadmill and watched other people use the different machines. I then started venturing out to the weight machines and have made that a regular part of my week 2-3 days a week. While walking on the treadmill one day I wondered if I could run on the treadmill. I was scared I would fall off, but after a couple days I gave it a shot. To my surprise, it wasn't as bad as I thought it would be. I was only able to run for a few minutes, and I was really slow but it was a start. I kept running a little bit at a time, and eventually tried to move to the road, but was in a lot of pain. After doing some research, I bought some new shoes from a running store and the pain was gone. It still took me quite a bit, but I worked my way up to running 3 miles at a time, and entered my first 5k in May. 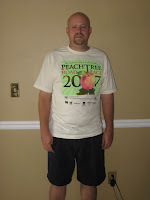 I was elated to run a 5k, since the last time I had run any race was a 10k when I was in high school over 20 years ago. It was a small race, and I finished last in 36 minutes, but I FINISHED! Around this time I started looking more into what I was eating, not just how much. I started counting calories and watching what I was eating instead of just how much. I also kept running now with my sights now set on a 10k. The lbs kept coming off, and I was very pleased with how everything was going, just continuing to tweak all the time. As I kept tweaking, I started to add whey protein into my diet for right after working out or running, I also started to eat 6 times a day. I would eat breakfast, snack, lunch, snack, dinner, snack. This really helped me since during this time I started to plateau a bit. I even had to up my calories at one point around here because I was not eating enough. July came and it was time for my 10k. I woke up on race morning and was almost 200 lbs. The race went really good, and I knew I was making good progress with getting my life in order as far as my health was concerned. I ran the 10k in 1 hour and 3 minutes. A devastating day came just a few days following my 10k. I continued to run, but was over doing it and pulled a muscle. When all was said and done I had to take 3 months off with almost no running to get my pulled muscle to heal. I was depressed because I was making such good progress, but I kept losing weight because I kept eating right and working out at the gym. I have now been back running for a few months, and have ran another 5k at 26 minutes this time, and have also run an 8k in 40 minutes. I have made progress that I hadn't even dreamed about. I am now in the middle of training for a half marathon which I will run on February 16th. I have for the past few weeks been running 5 miles two times a week in the morning and have been getting long runs in every other week following a training program. My longest run to date was 10 miles which I did in 1 hour and 37 minutes. I am set to put in 11 miles this Saturday. I even have my sights set on a Full Marathon sometime in 2008, and possibly even a Sprint Tri. All being said and done, I am now just over a week from my journey being at the 1 year mark. I have lost 78lbs, and would like to lose 10-20 more. Things have slowed down quite a bit which can be frustrating at times, but I know that is how it works when you get closer to your bodies ideal weight. I know this has been a long journey, but it is just the beginning of an entire life change. I have aspirations of continued success in running and toning of my body, as well as continued weight lose and further tweaking of my diet to make it even more healthy, and also continue to build habits to where it is just part of life. I will post updates as my journey continues to a healthy lifestyle, thanks for stopping by to read. You have not only done a great job losing the weight, changing your eating habits, and exercising, you have also done a great job of editing your blog! Congratulations! Keep up the good work! Never go back! Yvonne - Thanks. You will be able to run, just keep it up. Thanks for stopping by! wow, i am really moved by your weight loss endevour.. it's amazing. i hope that i can be as tough as you in living a healthy lifestyle. you did a great job! =D hey, why don't drop by my blog and give your thoughts on it. it's still very new and an entry from an individual like you would be a marvel (^_^) and we can even exchange links? Great job Tim! It looks like we were on the same plan. I started a couple of years before you, but everything looks pretty much the same as my story. Instead of a gym I went to group exercise classes. I am really motivated by peer pressure. When I did not show up I figured everyone was talking bad about me. So I had to go regularly. I have been at my current weight (give or take a few pounds) for over 2 years now. The slow way is the best way. The slow way is the best way! Just wanted to say congrats, and that I was using you as an example. The reason why is we're roughly the same age (34), and you're currently at the weight I'm aiming for (low 160s). Only two differences are that I'm 2.5 inches taller and I started out 14 pounds heavier than your max (272.6). So far I'm down to 226 (started 4/7/2008). Good luck with your running. I'm going to pick it up again when I get below 200. It'll be a challenge because I was on a running team in the Army (10:30 for 2 miles, 17mins and change for 5k). It'll be tough mentally to start running and be so far from those numbers. Great job getting down to 226, you will love running once you get to 200. I started running before I hit 200, just take it really slow at first, you will get there! Hello Tim, i`m kenedy, and i really would love if you take a look at my body transformation as well, i did it and i know how the journey is, besides of challenging is really great when you can see the results. Hope you like it and tell me about it!